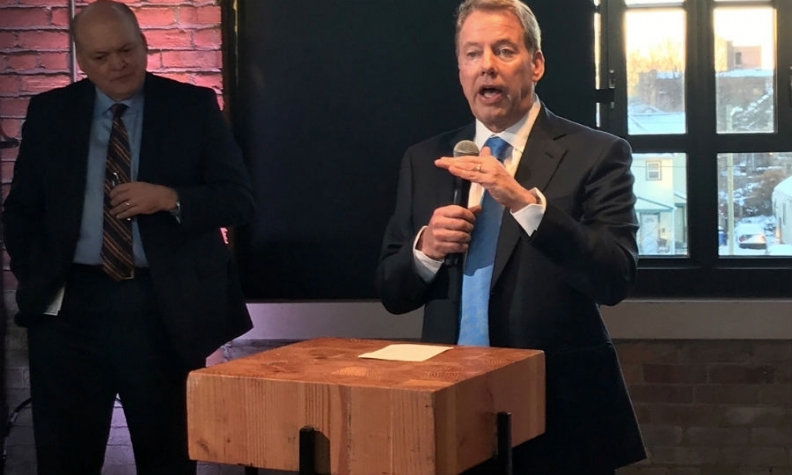 Bill Ford speaks at the automaker's new electric and autonomous vehicle office in Detroit, watched by CEO Jim Hackett. DETROIT -- Ford Motor shareholders should expect "fairly large" changes in the coming year, Executive Chairman Bill Ford Jr. said, building on the automaker's moves to discontinue some North American models and boost electric vehicle investment. The automaker has promised to cut costs overall but still faces questions about lagging performance in certain regions and calls for more details on its restructuring. Its shares have barely budged since CEO Jim Hackett took the helm last year. "It could be regions, it could be functions, it could be areas of emphasis," Ford said in an interview. "We’ve done some big things, and we still have some big things to do." The automaker lost $4 billion in South America from 2013 through the first quarter of this year, and its chief of global operations said in January it was "exploring every option you can imagine." Analysts have also urged an overhaul of European passenger car operations to help Ford reach its 8 percent pre-tax profit margin goal. Figuring out how to make Ford of Europe sustainably profitable has become a priority within the company again after a disappointing performance in the region last year. "We believe we can take care of all three," he said. Hackett since January has outlined plans to cut costs by a cumulative $25.5 billion by 2022 and prune Ford's list of North American sedans and compact cars, while boosting investments in electric vehicles and its product lineup in China. "We are adding lots and lots of new models, to the point where we are going to have in 18 months to two years one of the freshest showrooms in the industry," Ford said. Responding to criticism from environmental groups over a shift in the company's lineup to SUVs, Bill Ford said the new models will be more efficient than those they replace. "Already some of the SUVs are more efficient than their counterparts on the car side," he said. "I'm really pleased how quickly that learning curve has flattened out," he said. Shareholders will have an opportunity to ask questions via teleconference when Ford leads an annual meeting on Thursday, a year after he introduced former Steelcase CEO Hackett to lead the company, replacing Mark Fields. And despite overall profitability, Ford's market capitalization of $44 billion trails unprofitable Silicon Valley electric car maker Tesla, which has a market capitalization of $51.3 billion, a reflection of investor doubts that Ford can re-ignite growth. Ford shares fell nearly 2 percent on Wednesday after the company said production of its highly profitable Super Duty and F-150 pickup trucks would be temporarily shut down because of a fire at a key parts maker's plant.